It’s the competency that is the MOST UNEXPLORED. I think those are very good reasons to do some exploration, so let’s dig into some key questions. Do you remember the days of playground tug-of-war? No doubt, you can still feel the competing force pulling you (and probably heckling you at the same time). The balance shifted this way and then that way and one of the sides eventually took a tumble. Winning was a great feeling, but losing, not so much. The tug-of-war feeling we experienced as kids is playing out today in all aspects of organizational life as leaders navigate the natural paradoxes or tensions that exist—balancing short-term results and long-term vision, maintaining compliance and innovation, etc. Just like the two competing forces in a game of tug-of-war, paradox happens when seemingly contradictory activities operate together, and these natural tensions occur daily. We know that tension and conflict are not going away—we lead and work in an increasingly complex world, so rather than avoiding the tensions, we must get comfortable being uncomfortable and lean into the challenge—in other words, we must learn to effectively navigate them. Here’s the key with paradox navigation—it emphasizes and/also thinking. Notice how I described the natural tensions above—long-term AND short-term, compliance AND innovation—the use of the word AND is purposeful. Paradox navigation emphasizes and/also thinking rather than either/or thinking. Often, leaders put more energy into the tug (either/or thinking) rather than the balance (and/also thinking) and end up making short-sided, exclusive decisions. Why is paradox navigation so beneficial? Through the development of paradox navigation skills, leaders learn to leverage different perspectives to come to a fuller solution. For example, as a business leader, I am continually balancing what’s best for the business with what’s best for the individual employee (often two distinct perspectives) and I am a better leader and come to the best solutions when I consider both perspectives—that is the heart of and/also thinking. It’s not one or the other—it’s both. Why is paradox navigation so important for HR leaders? 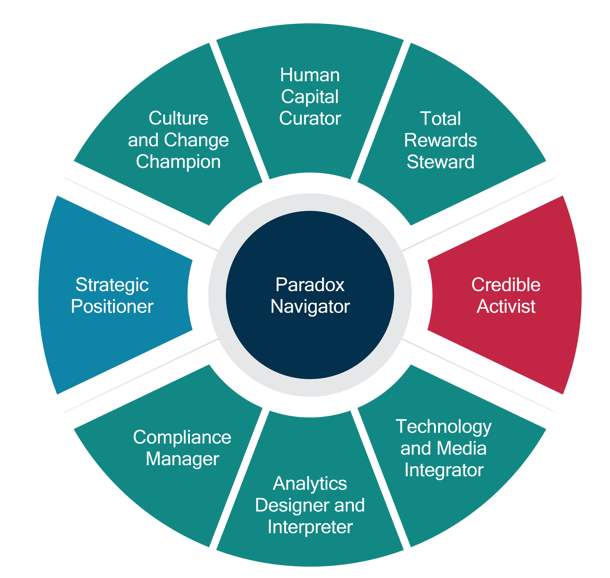 While paradox navigation is critical for all leaders in the organization, HR leaders are in a unique position to navigate paradox because of the breadth of relationships across the business and the broad business knowledge we have. In a recent conference presentation, I recently asked over 200 HR leaders how many of them would list “paradox navigation” as a competency important to their success. Only two people raised their hands. And yet, when I asked how many of could relate to the tug of war feeling, basically everyone raised their hands. So, this is new language naming something that we can all relate to. While paradox navigation is good for leaders and very good for our businesses, others may not like paradox navigators much for doing this important job as they can be perceived as disruptive and not following along. This can be a tough role for HR leaders to play which highlights the need to keep exploring and improving in this area. Serving as a paradox navigator can feel isolating so we must have the conviction and perseverance to do what’s right for our organizations. What can you do to learn more about paradox navigation? Yes, keep exploring! Purchase the book, Victory Through Organization. This book highlights the most recent research and the competency model noted previously. There is a specific chapter dedicated to Paradox Navigator and how you can improve in this area. Talk with your team, leaders in your business, and other HR leaders about this competency. Be bold. You are in your position for a reason, so share your perspective and do your part to navigate the natural tensions that pop up in your business. Remember, paradox navigation is and/or thinking. As Carl Jung once said “only the paradox comes anywhere near to comprehending the fullness of life,” so don’t shy away from the paradox—lean into it to better comprehend the fullness of your business.